Centurion, Pretoria, 26 May 2016–Eighteen months after the successful launch of its first ever brand concept store in Cape Town, BMW Motorrad – the motorcycle division of the BMW Group– today launched a second concept store (Bavarian Motorcycles) in Centurion, Pretoria. As part of the BMW Group’s ongoing future retail strategy, the newly renovated Bavarian Motorcycles offers motorcycle customers and enthusiasts in Gauteng a 360 degree premium lifestyle and retail experience. The new brand concept store includes a lifestyle centre with a coffee bar, rider and lifestyle apparel section, Roland Sands Design customisation lounge, sales area, workshop and clubhouse. Alexander Baraka, General Manager of BMW Motorrad South Africa, says that Bavarian Motorcycles, which is one of the leading dealerships in the BMW Motorrad global network,was an obvious candidate for a brand flagship store. “Bavarian Motorcycles is the best business blueprint for a BMW Motorrad dealership.Their commitment, business philosophy, attitude and passion for the brand as well as our products has secured them the reputation of being one of the leading dealerships in the BMW Motorrad global network,” he explains. Business partners Roger Smith (Dealer Principal) and Eric Teixeira, owners of Bavarian Motorcycles, say they were encouraged to make the investment into the brand concept store by several factors. “We have successfully grown our business from strength to strength over the last ten years and we believe that this is the next frontier to further growth, and to maximise our investment. For our customers, the new premises offers an opportunity for us to showcase all the aspects of the BMW Motorrad brand, which goes beyond engineering excellence, but also lifestyle,” explains Smith. 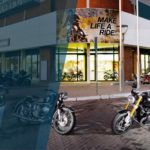 The launch of the first concept store (Donford Motorrad Cape Town)in 2014 coincided with BMW Motorrad’s new brand positioning campaign“MAKE LIFE A RIDE”. The new Bavarian Motorcycles comes several months after BMW Motorrad announced a new global business strategy with the aim of reaching sales of up to 200,000 units by the year 2020. • Expanding the global BMW Motorrad network from 1,149 to 1,500. Baraka says the future roll-out of brand concept stores like Bavarian Motorcycles is part of the dealer network expansion. Over the next two years, BMW Motorrad will be rolling out brand flagship stores in Asia, Europe, USA and South America. BMW Motorrad products and services are currently distributed in 95 countries and in 27 of those countries it is the market leader in the premium segment over 500 cc. “In South Africa, despite a decline in the market of motorcycles above 500 cc, BMW Motorrad has close to 40 percent market share. Our sales and market share are the result of the confidence that customers in our market have in the brand as well as our model line-up,” he explains. In September 2016, BMW Motorrad will introduce the second model of the BMW Heritage world of experience, the new BMW R nineT Scrambler, which was revealed in South Africa for the first time today.